On June 29 in Tokashiki Village, rice harvesting began. 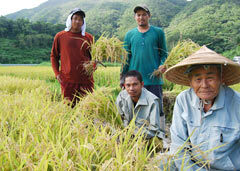 Rice farmers have been busy gathering golden-colored paddy rice such as Milky Queen and Hitomebore. As farmers face a labor shortage due to the ageing population, three agriculture trainees from the Philippines have provided some relief to elderly farmers at the Toyama Farm. The farmers appreciated the trainees’ help. Sacrificing their holiday for work, the trainees helped to handpick parts of rice that fall due to heavy rain, and they assisted with manual works before harvesting with a combine harvester. Eighty-four-year-old Seichu Arakaki from Tokashiki Ward said that he was grateful for the help from Filipino trainees. Seventy-six-year-old Seirin Toyama who hosts the trainees, remarked, “Thanks to the trainees, harvest is going well. Because of low temperature in March and April and the late end of rainy season, harvest is a couple of weeks behind the usual schedule. The quality is the same as usual.” The new rice will be consumed on the island.